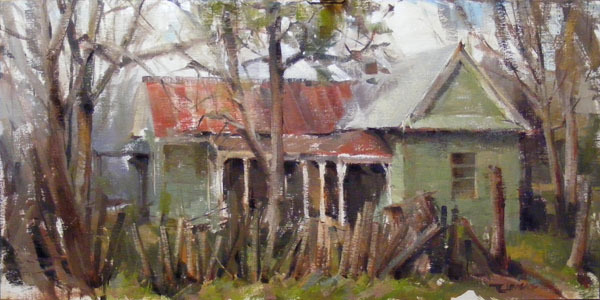 The Grove House- (Plein Air) 10x20" Oil on﻿ panel.﻿ SOLD This century old Texas treasure is on the road into Farmersville. Close to Home- (Plein Air) 10x18" Oil on﻿ canvas. This view is just outside the center of Farmersville, TX﻿, an old agricultural town not far from Dallas. Available at Frisco Fine Art Gallery, Frisco, TX﻿. 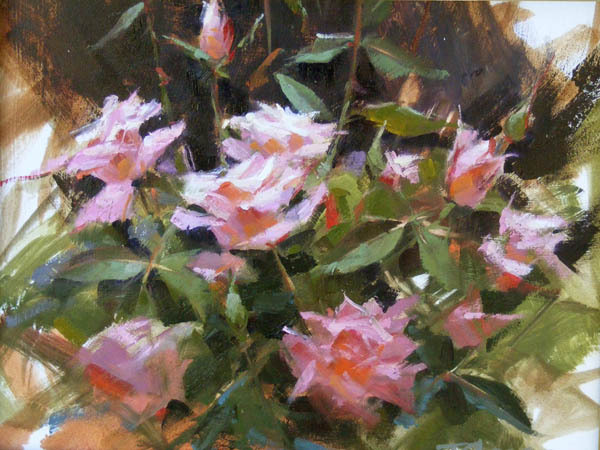 Fall Roses- (Plein Air) 9"x 12", Oil on panel. (SOLD) Painted at the Ft Worth Botanical Gardens during the third annual Camp Fire Paint Out. Camp Fire is a youth organization whose mission is "to build caring, confident youth and future leaders". Thirty or so artists donate works for auction during a 4-day weekend devoted to painting, camaraderie and literal pampering by the amazing Camp Fire volunteer staff. This piece garnered the THIRD PLACE award. 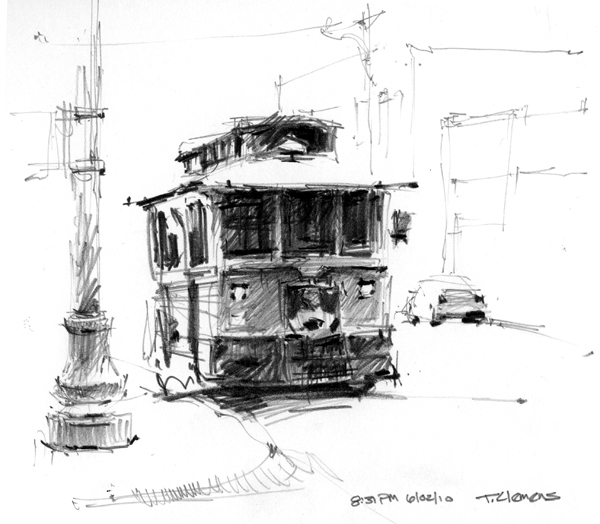 8:31 PM- (Plein Air) Pencil on paper (SOLD) Streetcar outside the Roger's Hotel in Waxahachie, TX. Activity on the square quiets as night falls: a few still wander by to view the courthouse; a lone skateboarder zips through on the sidewalk; live music drifts up from a cafe on College. Street lights suddenly go on. 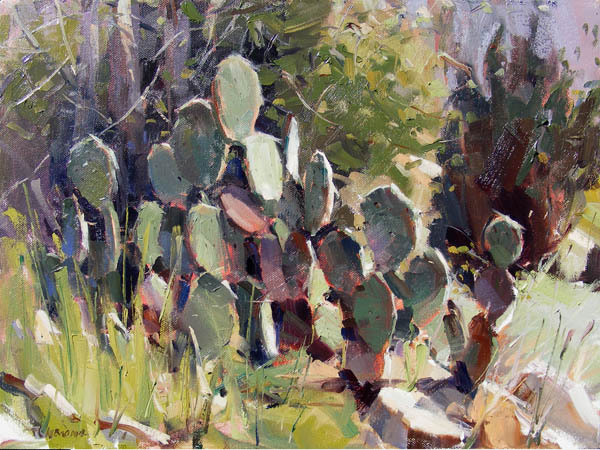 Cactus Stand- (Plein Air) 9"x 12", Oil on panel. 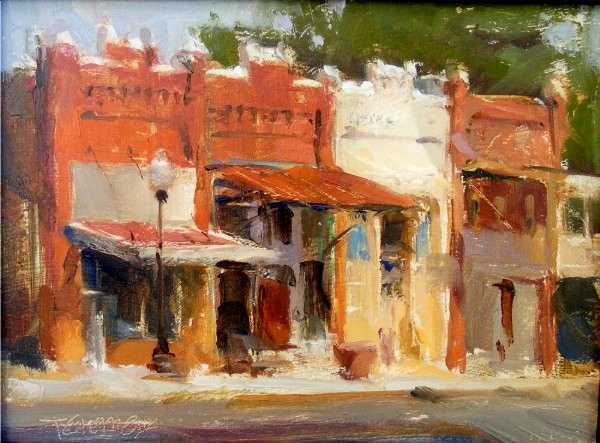 (SOLD) This painting was was honored with an AWARD OF MERIT in the Outdoor Painters Society "Plein Air Southwest" show in 2009. 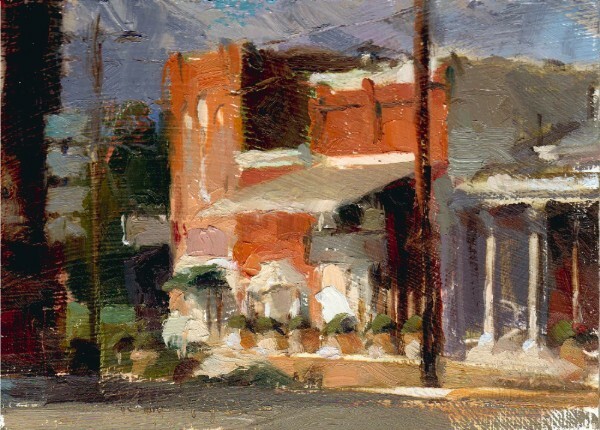 South of Main, Mt Vernon- (Plein Air) 5"x7", Oil on panel. (SOLD) Sunday morning off the square in Mt Vernon, TX. I'm told this East Texas town, and Franklin County seat, is actually named after the historic George Washington estate. You might be right to guess where the county name comes from as well. 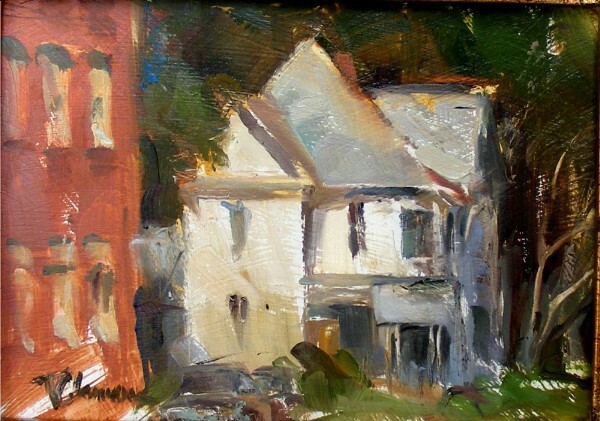 Victorian Morning- (Plein Air) 5"x7", Oil on panel. This dignified, but weathered old lady sits just off the Square in Waxahachie. Probably too far gone for repair, she quietly speaks of grander days when cotton reigned in this Texas prairie town. 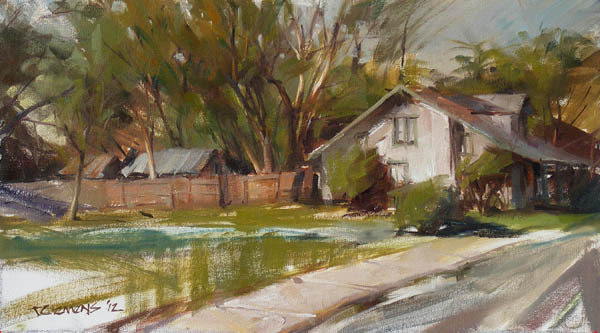 Along College- (Plein Air) 6"x8", Oil on panel. (SOLD) Storefronts off the Square in Waxahachie, TX. This was painted during the 4th annual "Paint Waxahachie" event. It received BEST OF SHOW honors in the judging. 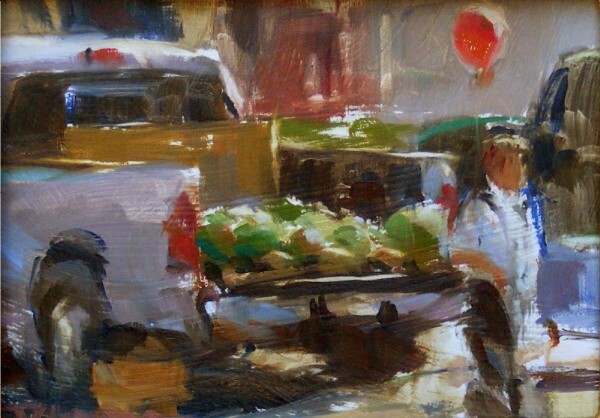 Watermelon Truck- (Plein Air) 5"x7", Oil on panel. (SOLD) The Paint Historic Waxahachie event kicked off with a 90-minute quick draw in the courthouse square. A farmers market brought in produce and other sellers to add visual interest for the 40 or more speedy plein air participants. 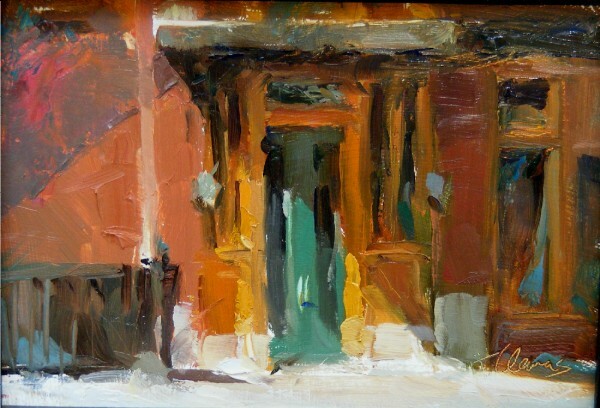 Closed- (Plein Air) 5" x 7" Oil on panel. (Private Collection) Front door at the historic Rogers Hotel on the Square in Waxahachie. 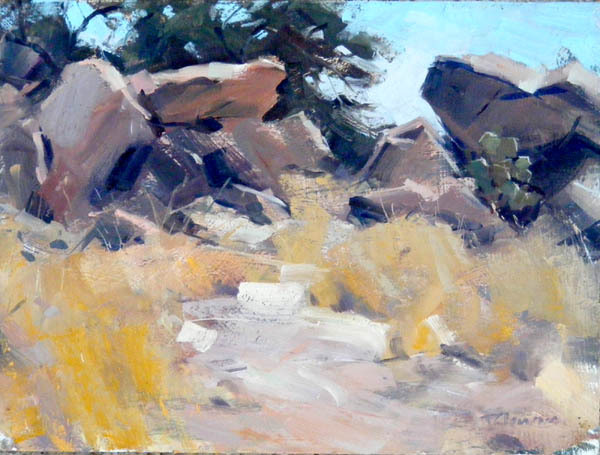 Painted during Ellis County Art Association's 4th annual plein air event. 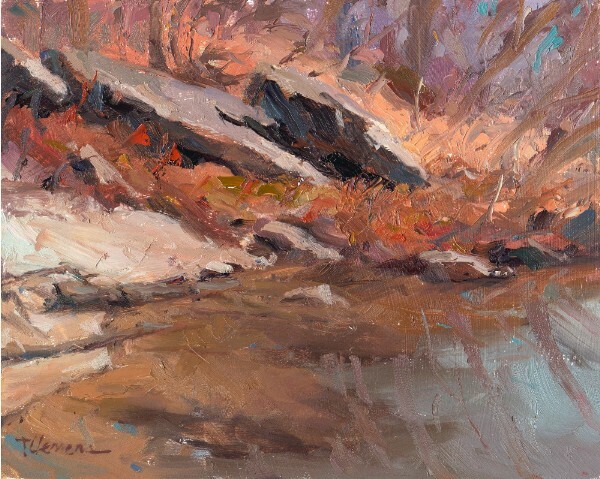 Down to Spring Creek- (Plein Air) 9"x 12", Oil on panel. Garland,TX is known more for its business parks and rooftops than scenes like this. But hidden in the trees at Spring Creek Preserve is the namesake waterway cutting deep into the blackland prairie and the white bedrock below. 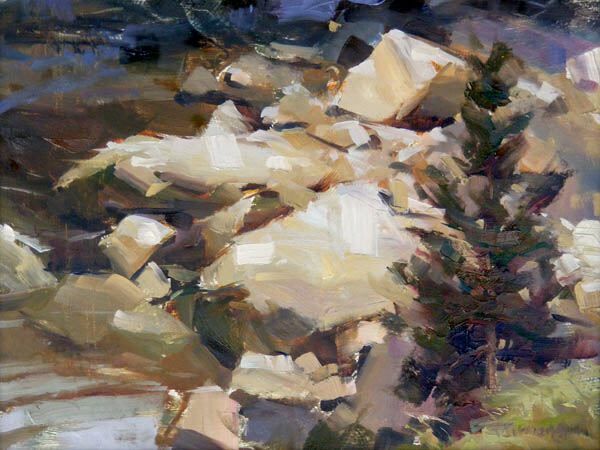 Rock Slide- (Plein Air) 10" x 8" Oil on panel. (SOLD) A scene on Rowlett Creek in nearby Richardson. 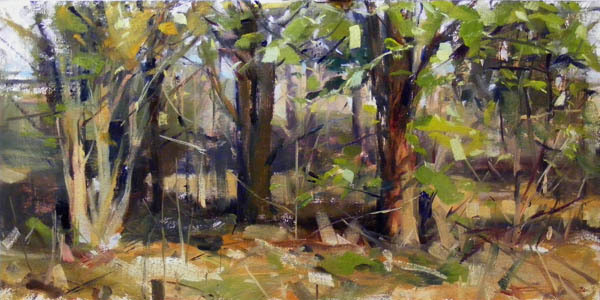 Hot Sun Deep Shade- (Plein Air) 9"x12", Oil on panel. View from the roadside, the horses were on the property of His Hill Bible School in Comfort, Texas. 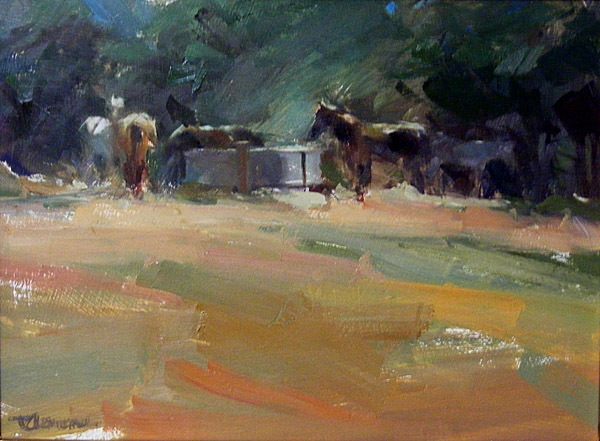 I first did a quick sketch before the horses moved into the pasture below. My wife and I were staying the weekend with a good friend - who stopped by to say it was 106 degrees. I love the heat. The road, used mostly by uphill residents and weekend camp traffic, surprisingly, also brought conversation with two hikers and a cyclist. 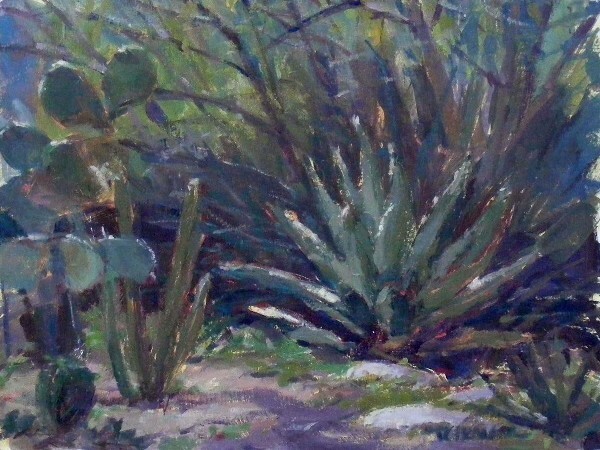 Cactus Garden- (Plein Air) 12 x 9", Oil on panel. 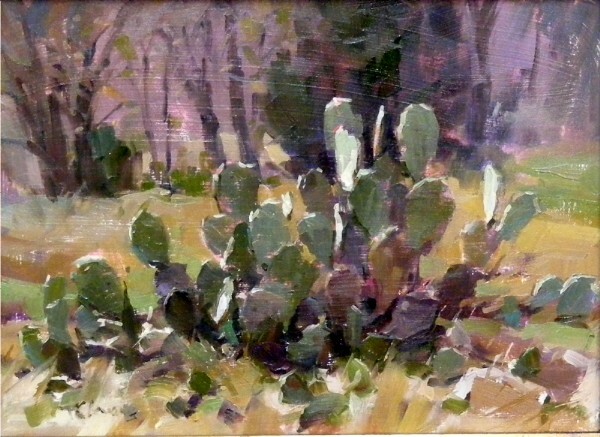 (SOLD) At the Ft Worth Botanical Gardens, painted during the Campfire Plein Air Paintout, Oct. 23-26. Leading into their annual "Artist's Christmas" fundraising auction, 25 artists contributed paintings produced during the weekend for the Nov 8th auction. Superbly organized event, we were treated like royalty with lunch, water deliveries and gourmet, home-made cookies! This painting received fourth place honors in the judging competition. Three things I like most to do... Be Outdoors, Paint and Watch the Grass Grow. With plein air painting I get to do all of them at the same time. These works are painted almost entirely on site (I usually leave a few finishing touches and signature for the studio). One of the pleasures of painting is observing and recording. I like to be faithful to the subject matter to give a true sense of time and place as well as manipulate to create a visually interesting piece. 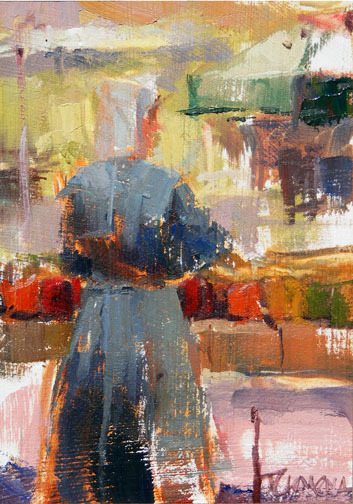 Amish Vendor - 7" x 5" oil on panel (SOLD). Painted during the annual "Paint Waxahachie" quick-draw, this earned FIRST PLACE honors. Copyright 2018 Ted Clemens Fine Art. All rights reserved.